You are here: Home ∼ 2010 ∼ November ∼ 22 ∼ Canned Cranberry Sauce! Thanksgiving is just days away and I am so excited! A few months ago, my husband and I moved into a new apartment with a great big kitchen and I have been looking forward to cooking Thanksgiving dinner in it since we got here!… Ok, helping to cook Thanksgiving dinner. Even though I have been cooking a lot lately, Chris has been the Head Chef for this holiday for years and has perfected the art of Thanksgiving cuisine. 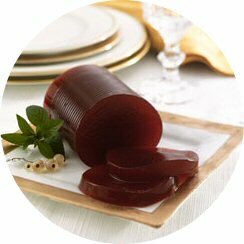 The food that I think I most look forward to on this special occasion is canned cranberry sauce! I LOVE IT! I love the flavor, the jelly consistency, I love the suction sound that it makes when it slides out of the can and I like how it holds it’s shape once it has made its way out! Now, while I do enjoy slicing the sauce along the corrugated lines, as seen pictured above, I WILL NOT MASH! NEVER MASH! I just feel like that ruins it, but, if you prefer to mash, I won’t judge. If you haven’t already done your Thanksgiving grocery shopping, here is your canned cranberry sauce reminder! And if you have, I hope it made it’s way into your reusable shopping bag! If not, you still have a few more days! OMG OBSESSED!